I have been a user of SwiftKey tablet and standard on all of my tablets over the last year or so, and it has just had a major upgrade to 4.3. The older version you had a tablet and standard version, the standard version was for phones and smaller screens and then the tablet version for larger screens. Though the standard version did work on the tablet but the key size was to small to be fully usable, thought the standard version had cursor keys that could be displayed on the main layout and the tablet version was missing this. The new version greatly improves on the layout, there is now only one version for all types of devices and sizes. The main reason I prefer SwiftKey is the text prediction is amazing and does help how you type. I have tried different keyboard Including the official Google keyboard on Android 4 and above, even though this does have word prediction it is really not on par as any other keyboard, I have tried Gokeyboard but just didn’t like it, you do have a lot of customisation, but just didn’t feel right. And then the main other one is Swipe though again I never could get on with this one, I’m not that good at typing using the Swipe function, maybe that just me that I am use to typing on a normal keyboard for all these years. With all the writing I do I still prefer the use of a physical keyboard, though using my new tablet the sumvision voyager 10.1 from my old tablet a zenithink c91 upgrade 10″ I had a USB keyboard case combo, but this didn’t fit quite right with my new tablet so was really forced to get used to the onscreen keyboards. Even on my phone I prefer the physical keyboard as I still have a HTC Desire z. So now getting back onto SwiftKey, the great function for me on the new version is on the main layout you can show left and right course keys and if press the number button you have fill cursor keys, the may seem a very small and silly function but for me this is a great addition, because I write a lot of text and need to goto different parts of the page to edit, you can touch where you want to select but I don’t seem to be able to get to th exact play so having the cursor keys on the min layout for navigation is great. The text prediction on SwiftKey is the best I have used and I can now type nearly as quick as using a physical keyboard, though in one sense it is better with SwiftKey as my spelling sometimes isnt that great so I make simple spelling mistakes, but with SwiftKey it corrects simple spelling mistakes automatically. You an select up to 3 simultaneous languages and can add your own word to the text prediction, it can also learn word from cloud services like Google mail, Facebook etc. It also lens the way you type so can predict the next word you may type. You can also use text flow like Swipe but haven’t used the function yet. You can also synchronise your user dictionary over the cloud for all devices you have SwiftKey installed. You can now choose 5 different sizes of keys, you can also undock the keyboard so can move it anywhere on the screen and also have 3 different toe of layout. You have several colour themes for the keyboard to suit your needs. I like to have the keyboard docked and the middle size using my tablet so that the keyboard just takes under half the screen size, as I have largest finger so easier for me to type. You can also select key sounds and vibration feedback on your keypresses. The app normally costs about £3 but is on sale in the last in for there autumn sale at only £1.49 which is great value for a keyboard that will help you type a lot faster on your device and if like me you are now using a able for basic computing instead of a laptop / netbook this would be a must have for your tablet device. – SwiftKey takes the hard work out of touchscreen typing, replacing your phone or tablet’s keyboard with one that understands you. – It provides the world’s most accurate autocorrect and next-word prediction in 60 languages. – It connects seamlessly across all of your devices, with SwiftKey Cloud. – SwiftKey predicts your next word before you’ve even pressed a key. – It intelligently learns as you type, adapting to you and your way of writing. – SwiftKey doesn’t just learn your popular words, it learns how you use them together. – Backup and Sync keeps your personal language insights seamlessly up to date across all your devices. 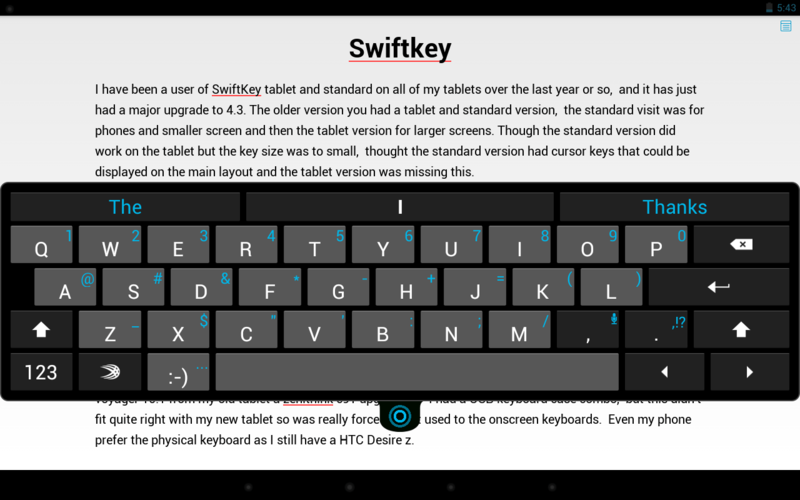 – Teach SwiftKey your writing style based on your language use from your Facebook, Gmail, Twitter, Yahoo, SMS and Blog. – Your language model can be enhanced each morning with Trending Phrases based on current news and what’s hot on Twitter. – Enable up to three languages at once. – Naturally combine languages without having to change a setting. – SwiftKey supports contextual prediction in 60 languages and counting. – Switch seamlessly between tapping and gesture-typing with SwiftKey Flow. – SwiftKey Flow combines the mind-reading capabilities of SwiftKey with the speed and ease of gliding your fingers across the screen, with real-time predictions. – Type entire sentences without lifting your finger from the screen, simply by sliding to the space bar between words.